So, why do we need to grease a baking pan anyway? Any batter poured directly into a pan can potentially stick to the pan and never want to come out…Ever. It will still taste good if it gets stuck, but it will be really hard to make it look good once it’s been torn out using any means necessary. Simply put, greasing the pan prevents sticking. This post contains affiliate links, I earn from qualifying purchases. Funny, this becomes a heated controversy between bakers who swear their method to grease a baking pan is the best method. I’m just going to cover the ones I know and you can choose your allegiance to your favorite. You may even end up like me and use different methods for different recipes. Hey, whatever works is the “right way.” Right? 1) Store bought non-stick baking spray or pan release. Non-stick sprays made especially for baking can be bought at the regular grocery store or in a baking supply aisle at a craft store like Michaels. I like Bakers Joy Cake Pan Spray the best. These baking sprays are combo non-stick cooking products with added flour to prevent sticking. Truthfully, I’ve used plain cooking spray and had success. Simply apply the product on the surface of the pan and follow the instructions for baking. After spraying, I place a circle of parchment in the bottom of the pan and then spray another light coat. Wipe off any overspray around the rim of the pan to prevent the brown and greasy look that happens over time. If you are a visual learner, this video on how to spray a pan is a great 44-second watch! 2) Grease and flour the pan. Either butter or shortening work to grease a baking pan. (I’m a butter girl, but I don’t feel too bad for using shortening here.) Shortening can result in less browning of your cakes edges, which is a good thing. To begin, use a paper towel, the end of the unwrapped stick of butter, or a clean hand and coat the inside of the pan very thoroughly. Pay special attention to the corners where sticking loves to happen. Place your parchment in the bottom of your pan at this point if you are going to line your pans. My visual learners, here’s another short but sweet video demo on how to grease and flour a cake pan. Some recipes even suggest you coat the pan with cocoa! I’ve never done this, but I can’t see a reason why it wouldn’t work. 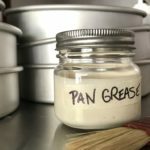 3) Make your own pan grease. Typically, I use my own homemade pan release. It is perfect for getting in the corners and crevices of all shapes of cake pans, costs only a few cents to make, and it has an incredibly long shelf life. All you have to do is store it in the cabinet in an airtight container. All you need are equal amounts of 3 simple ingredients: vegetable oil, all-purpose flour, and shortening. Then you dump them all into a large mixing bowl and beat on high for 5 -10 minutes. Keep mixing until there are no lumps and it’s all white and fluffy. If you have a stand mixer with a whisk attachment, this will be easy peasy! Voila! A magical way to grease a baking pan! Just apply with a pastry brush, be sure and get it into the corners, and you’re all set. This recipe can be doubled or tripled depending on your needs. I’ve used it at home and in commercial settings with great results. Easy to make, easy to store homemade pan release recipe. In a large mixing bowl or bowl of a stand mixer add oil, flour, and shortening. Whip ingredients on low for 1 minute until incorporated, slowly increase mixing speed to high. Whip on high for 10 minutes. Apply a liberal coat to baking pans using a pastry brush whenever instructions call for greasing and flouring the pan. Store in airtight container. If oil separates during storage, stir to incorporate. There you have my go-to methods for how to grease a baking pan. I’ve seen people say just “butter the pan” but I haven’t had good luck with batter and just buttering a pan. One of my bundt pans even came with the instructions to melt butter and evenly coat the inside of the pan. I’ve never had a cake stick so badly… not pretty. Whatever works for you is how you should grease a baking pan! People get galvanized for “the best” way to do things. They will come up with reasons for why you should never use the baking spray or why you don’t need to flour your pans. But really, all three methods work and you will find your favorite. What’s your favorite way to grease a baking pan? Have you ever had a “stuck in the pan” disaster? Boy, I have! Please leave a comment below or feel free to drop me a line!